It is almost time for the 2014-15 College Football season. The AP Preseason Top 25 has been released and we are just over a week away from the first game. 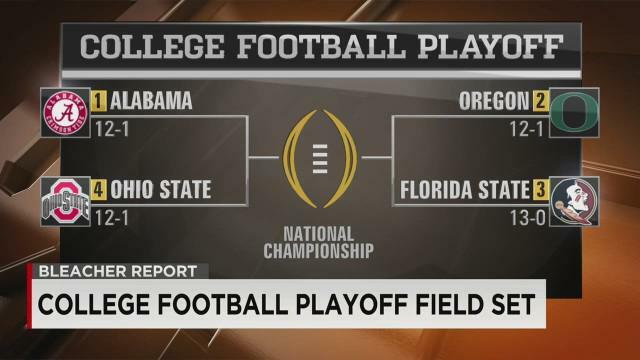 Also new to this season is the 4-team playoff format. While this doesn't exactly eliminate the controversy inherent in college football, it is a step in the right direction. If Tennessee can get to a bowl I will be dancing in the streets! New conference! Don't really know what to expect, but hosting FBS teams for the first time is exciting. Do you think the teams in the SBC will really get casual fans any more excited than the SoCon teams you played though? I really don't see anyone getting fired up at Charlotte for any of the CUSA teams except maybe Marshall. Most people in this area don't know schools like ULM or North Texas from someone like Samford. I have a hard time getting excited for college football because 50ish % of teams have 0 shot at a national championship. It's not even that it is unlikely, they have literally have no chance, even if they went undefeated. In terms of the casual fan reaction to App's conference move, with 5 much larger FBS athletic departments in the state, App is not in the position to try and attract the casual fan away from those teams on Saturdays. The Sun Belt move had IMO more to do with the SoCon's ideas of how to move forward clashing with App's ideas of how to move forward. Charlie Cobb was very deliberate during the introductory press conference when he in summary stated that App appreciated what the SoCon helped App accomplish, but sticking to the status quo wasn't good enough. It was to the point where he only team fans really got excited about playing was Georgia Southern, because they were the only like-minded school left in the conference and not coincidentally made the jump too. I find this ironic considering Charlotte spent years in a grassroots campaign to convince an athletic department that wanted nothing to do with the sport to field a team. This is like the Bring Back the Buzz guys saying "You know what? This isn't fun" if Lance blows a gasket and Al limps the team to 35-47 mediocrity next season. When your football is in the "niche" situation like I described earlier, you improve everything around the games to make them almost secondary. This was Cobb's calling card and why he's just as responsible for the success ASU has had as Armanti was. What makes football unique (especially college) is the gameday environment surrounding it which you can't get in other sports. Improve that gameday environment and people will show up regardless of opponent, because the environment will always remain the same. A "mid-major" as we consider the term today hasn't won a national championship in basketball. Do you find it difficult to support Charlotte basketball? The beauty of the NCAA Tournament and BCS Bowl games is it can be a victory for the mid-majors even if they don't end up raising a crystal ball. Try telling Davidson, VCU, George Mason and Butler their Cinderella runs in the tournament weren't a positive for those institutions. Look at where Boise State is now as a result of 2 BCS victories they have even if the system may have screwed them. If you're a brand new school to the FBS ranks expecting national titles, you're going to be disappointed. Ready for ECU's first season in the American Athletic Conference! I'm definitely happy to say goodbye to UAB, UTSA, MTSU, FIU, FAU, Marshall, etc and say hello to UCONN, Cincinnati, UCF, USF, Houston, Temple, Navy, etc. Even with the "P5" autonomy, the AAC is in the best position of any "G5" conference to weather this storm. When I say I don't see anyone getting fired up, I guess I'm speaking more about myself. As for basketball, while a mid major hasn't won the tournament in a long, long time, at least the opportunity is there. Butler almost did it. VCU was a game away. Wichita State was a game away. George Mason was a game away. Butler, VCU, and VCU all had the talent to win the national championship. I feel like Mason's was a bit more of a fluke, but even they had some serious talent on that team and a great coach. Unlike football, the mid majors are actually getting better as players realize that going to a solid mid major program is better than playing for bottom feeding schools at major conferences. Coaches are also starting to realize that 2-3 years at a major program that blows is not better for the career than staying at a well run mid major program that can afford to pay a seven figure salary (which any school can after making strong showings in the NCAA tournament). Major football programs can horde talent and let it rot away on the bench. In basketball, there aren't enough scholarships available to do that. I can get far more excited about basketball because even though we have been pretty mediocre since the original CUSA fell apart, we still bring in guys every year that give me a lot of hope. This year we signed a 3/4* kid from Charlotte (Scout had him as a 4 star, everyone else as a 3) and we have two four star kids that transferred back from power conference programs (one of which was an ESPN top 50 player in HS). In basketball 2-3 guys can give you the ability to compete with anyone. I wasn't expecting national titles and I don't feel like the new system will lead to more Boise State's being possible. In the old system, Boise had virtually 0 margin for error, but there was a sliver of hope they could get a title game appearance. The new system makes it virtually impossible unless you are in a power conference. Anyway, good luck on your first season in FBS. I'll probably watch most of your games this year. You guys got kind of stiffed on the home schedule from what I remember. Next year's home schedule should be better. It's really hard for me to get excited for our season this year because we're playing for nothing. It'll be similar to last year. A lot of young guys, a lot of guys getting redshirted, and a lot of highs and lows. Still can't believe we refused to take a hometown 4* QB transfer that was fighting for the starting position at Tennessee. I'm all for recruiting high character guys, but I also want to win, especially in these crucial early years. Still can't believe we refused to take a hometown 4* QB transfer that was fighting for the starting position at Tennessee. I'm all for recruiting high character guys, but I also want to win, especially in these crucial early years. What's the story on that? Any links or anything because I've got a buddy that was about to cream his pants like 3 weeks ago because you guys had Riley Ferguson and Uriah LeMay coming your way. I know LeMay is enrolled, but what happened with Ferguson? Ferguson plans to enroll in the spring. We have no intentions of letting him on the team. Maybe that changes in a year's time, but apparently the coaches don't want him. Someone should give Lambert a call and tell him he ain't at Wake Forest anymore. Some people were saying he had character issues and you don't want guys like that on the team, but if that was the case, then why take Lemay? Lemay had felony charges for trying to cash a check twice (or something like that). Others have said that the coaches only want to take 1 QB per class, which to me is even more foolish. Players get hurt, transfer, and don't live up to expectations all the time. If there is one position you should stockpile talent, it is QB. We did sign a promising prospect at QB this year. He was a 3* that had some late attention from some SEC programs, but he stuck with us. I feel good about him, but I don't just want to hand him the job in a couple years. I think the only true advantage to only taking 1 QB per class (assuming you get the QB you want) is the substantial lack of the possibility of a QB transferring (which obviously can set a program back years). But the flip side of that is obvious. There is strength in numbers, and the more talent you have at important positions, the better position you are in. I agree with you in that I don't like the idea of hand delivering someone a starting job by only taking 1 QB per class. Competition drives success. With that said, though, coaches surely have a lot to balance between team success and individual player morale. Charlotte in my opinion is in a spot where if they DON'T take Riley Ferguson (who has 3 years of eligibility left) to C-USA with them, they're doing their program and their fans a disservice. Like you said, taking LeMay and not taking Ferguson who has a clean record but maybe a bad attitude makes no sense. Ferguson would be playing at home with his brother and that alone will make him more comfortable. Maybe Lambert is just playing a game with the kid, making him earn it. But we're talking about a former favorite for an SEC starting job here. And Tennessee may be low on wins recently but they aren't low on QB talent. His brother quit the team by the way. He wasn't expected to get playing time. WR is the one area that we have recruited exceptionally well. I definitely agree with you 100% though. but apparently the coaches don't want him.